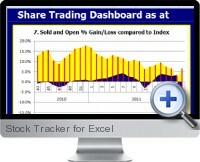 The Stock Tracker for Excel (Share Trade Tracker Pro) is a stocking tracking and portfolio performance analysis solution for Excel which automatically updates price information for valuation and reporting. Stock portfolios can be quickly and easily tracked with advanced performance reporting leveraged from the analytical features of Excel. Automatic download and update of stock prices from the internet. Individual stock and portfolio gain/loss value and return percentages are automatically calculated. Technical analysis includes daily returns and 52 week highs/lows for each stock tracked. Tracks and benchmarks the overall portfolio with a selected index. Stocks from any exchange in the world can be included in the portfolio. Dashboard reporting of the portfolio updates with key performance measures.